Glass fragments are usually what thieves leave behind when they try to break in and steal something of value. But with art, everything could be made beautiful. Glass fragments are no longer just remnants of a crime, they could be art. Glass fragments could become a wall art, made into a figurine, or transformed into a much useful thing like a furniture. Italian furniture brand Tonelli, which is an expert in crafting glass furniture, coalesced expertise and innovation in order to find a better use for glass fragments. Tonelli successfully created dazzling and functional furniture pieces made of glass fragments. Tonelli’s collection of small tables known as Il Paese delle Meraviglie highlights glass fragments in its design. The line is from the creative mind of designer Paolo Lomazzi, the award-winning Italian architect known for using industrially advanced materials and technology in creating industrial products. The use of glass fragments in the collection allows each piece to exude uniqueness. The line consists of six models, most of which are distinguished by the use of colorful cones and spheres made of glass fragments. The tabletop is a glass disc, which provides a perfect hue juxtaposition. The name of the collection translates to “Wonderland.” Indeed, the room transforms into a wonderland because of the table’s luminescence. “Each piece, poured and finished by hand, creates a unique and exclusive product,” Tonelli describes the collection, which was released in 2018. 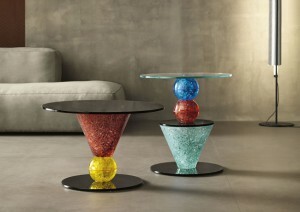 These Italian furniture tables could light up any room with its bright and fun colors and marvelous designs. Craftsmanship is truly on display as each table is mostly handmade. The tables can be used as bedside tables, corner tables, center tables or display table. Each piece may even be confused as a sculpture.